Under the old system, this game doesn’t even happen. The BCS would have assembled a final of Alabama and Florida State, the current participants in a hypothetical bronze medal game (Wait, why isn’t there a third-place game?) instead of the finalists of Oregon and Ohio State. The Buckeyes don’t get in either under the old system, and the 2010 Rose Bowl rematch never happens. Neither does the greatest game in Oregon history, Thursday’s Rose Bowl, at least so far. However, Thursday’s game did happen, so in honor of Oregon’s school record 13th win, here are 13 thoughts on the Rose Bowl. 1) Before we revel in the greatest game in Oregon’s history (so far), just remember that the college football powers had to be dragged kicking and screaming into this new system that went two for two so far in producing awesome games. When the college football powers tell people we can’t change something stupid and anachronistic “for the benefit of the game,” please assume in the future that they are lying. 2) 2014 was the luckiest of years for the Seminoles. Not necessarily good, just lucky. While we all know about the football team’s escapes, nothing more perfectly sums up Florida State’s year than its final athletic contest of the calendar year, a men’s basketball game against rival Florida, which was won by an inadvertent own goal by a Gator in the closing seconds. 3) The results of 2014 for Florida State got it to the Rose Bowl, but the game wouldn’t be played in 2014. It would be played in 2015. 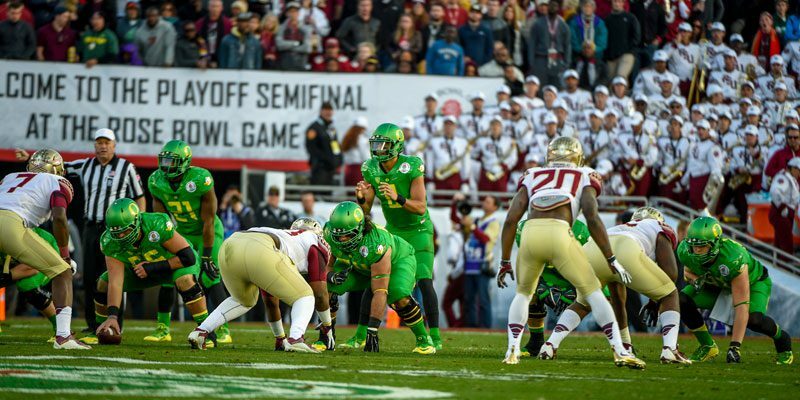 4) The first half was everything Oregon fans feared. Early injuries, Florida State players playing past the whistle without penalty, shaky officiating, difficulty moving the ball. Oregon fans weren’t the only ones concerned. Florida State fans were just as worried about the their lack of ability to capitalize on mistakes made by the Ducks, producing the rare halftime environment where both fan bases were disappointed. 5) While nail-biters where a team came back from a big deficit are often the most memorable games, ones where an opponent of significance was completely dismantled are a close second. However, destroying an opponent from the outset of a game can lead to a revisionist history where an opponent is discounted in memory. To really crystallize that blowout, it requires the game be close for an extended period of time, usually at least a half, before the doors get blown off the opponent in a short period of time. 6) Those turnovers are how a game that felt reminiscent of the 2011 National Championship early becomes more evocative of the 2005 Orange Bowl. If you don’t remember the 2005 Orange Bowl, it was much the same game: The Pac-12 champion playing against a team that only had a shot at the title based on reputation, a combination of playing in the title game the year before and an undefeated record during the current season, only to have an endless series of turnovers turn a previously close game into a rout. The moment Jameis Winston realizes it’s over. a. Jameis Winston may be a controversial figure, but his career hasn’t been without memorable moments. He has managed to amass both achievement (the Heisman Trophy, a national championship) and scandal (criminal allegations and other off-field incidents) in his short time at Florida State. If Winston turns pro in the next two weeks, his college legacy will be cemented. If it is, nothing is funnier than the fact that his fumble against Oregon will always be the first thing people remember. b. No one deserved to return that touchdown more than Tony Washington. While much was made of Florida State’s undefeated regular season, the only thing that separated the Ducks from an undefeated season was Washington’s penalty against Arizona (which, again, shouldn’t have been a penalty). Washington never deserved the criticism he got for the Arizona game. His play against Florida State will forever be remembered long before anything from the Arizona game. d. I would describe the hysteria in the Oregon section during this play as being on par with the first time the Beatles arrived at JFK airport. 9) I hope to amend this sentence in a week, but Thursday was the greatest day in the team’s history. e. Not only because they did so by absolutely humiliating them in front of an audience of 28 million viewers. h. But because they won so big, it blew Urban Meyer away. 10) I couldn’t be happier for Mark Helfrich and Don Pellum. Both of them had been previously maligned at various points in the season as not being the equal of their predecessors. Yet their coaching this season has netted the Ducks a Rose Bowl victory and a national championship appearance, making their accomplishments every bit the equal of their predecessors. 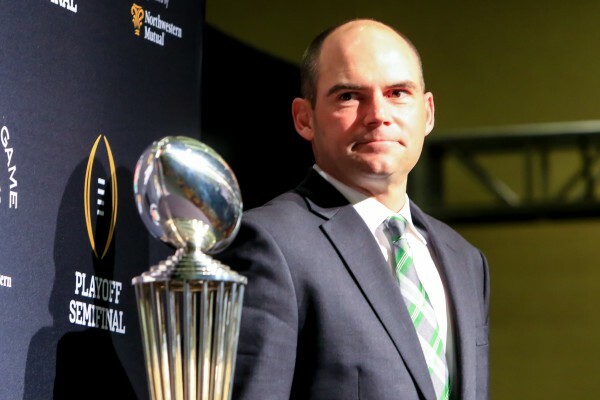 Mark Helfrich is now tied for the most Rose Bowl victories by an Oregon coach. 11) I understand the necessity of disciplining Oregon players for mocking the Florida State chant — they simply can’t do that while on the field in uniform representing the school, but the reporting of the story made it seem as though the players involved were rogue comedians telling a tasteless joke rather than providing the entire context. The taunt didn’t begin with the players but in the stands. Fans began the taunting chant as a protest of a team and university whose prioritizing of football over its responsibility to provide a safe environment for its students was backfiring before its very eyes. Florida State had tried to take the scoreboard high ground instead of the moral one, and now they were losing on both boards. By using Florida State’s “war chant” — a song in itself controversial — to taunt the team, it addressed two highly controversial topics related to Florida State whose conducted was deemed unacceptable by the majority of Oregon fans. Indeed it was effective; the mocking chorus hushed the band’s playing of their chant by early in the fourth quarter. Much of the criticism of the incident has to do with the perception of making light of a serious crime, but if such a taunt was criticized on the grounds that it made light of it, what does it say about Florida State that Oregon’s players are facing more discipline for taunting their players’ crimes than any punishment Florida State’s players actually faced for them? 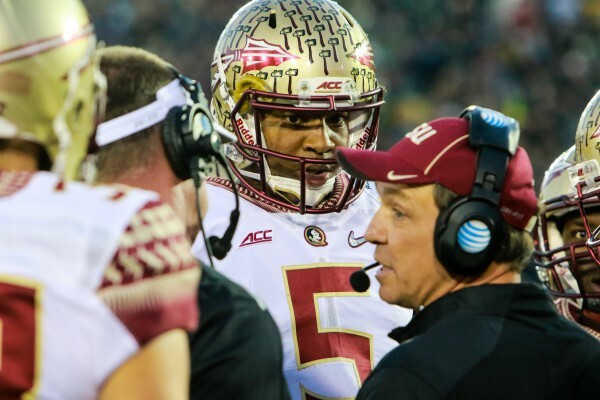 Confusion dominated the Florida State sideline on Thursday. a. I’m pretty sure that is the definition of the pot and the kettle. c. Walking off the field without congratulating their opponent. d. Or fans keying Seminole players’ cars following the loss. e. Here is what Florida State fans will never understand: They will always perceive that the animosity Oregon fans had for them was due to their success, akin to the type of fan behavior common within that region. What they failed to get was that Oregon has no reason to hate a school like Florida State in a vacuum; the hatred always came from the Seminoles prioritizing winning football games above all forms of social responsibility. Everyone outside of their fan base resented them for it, Oregon fans were just the ones lucky enough to play them. It wasn’t classless, it was the collective celebration of one school’s deserved comeuppance. 13) Woke up at 4:30 AM and drive 16 hours on Wednesday. Did the same thing Friday. Absolutely worth it.